Updated 29 March, 2019 - Given the sheer amount of water that passed through Beira during Cyclone Idai and the volume of damage caused, it’s not surprising that there are outbreaks of water borne diseases like cholera in the city. MSF is supporting the Ministry of Health to care for patients suspected of suffering from cholera in three health centres of Beira and has so far been treating more than 100 patients a day. In the coming days we will work alongside the Ministry of Health to scale up as much as possible and provide support to more cholera treatment units as well as work to rehabilitate a larger cholera treatment centre. We have cargo planes arriving daily with the supplies we need and are also flying in experienced medical and logistical staff members from our projects in Mozambique and around the world. We are also in discussion with the health ministry about supporting a large cholera vaccination campaign in the area. Update 27 March, 2019 - More than a million people are struggling to rebuild their lives in flood-affected parts of Mozambique, many of whom are in urgent need of assistance for the basics to survive. The response to the disaster caused by heavy flooding and Cyclone Idai will be simply enormous in scale. 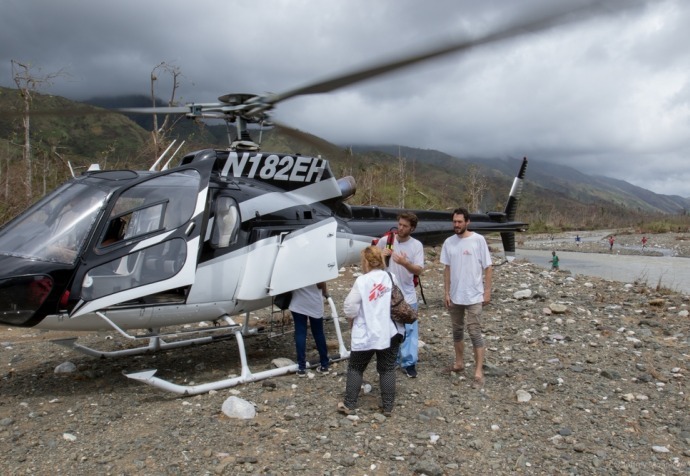 Médecins Sans Frontières (MSF) emergency teams have started medical response activities, and the humanitarian emergency medical organization is scaling up with its emergency response systems fully activated. In the Mozambique port city of Beira, high winds and high waters have so far killed at least 447 people according to the Government and damaged or destroyed thousands of buildings - homes, schools, health centres andhospitals - across the area. Many families are left homeless and most communities are without reliable access to clean water or electricity. 25 March, 2019 - MSF emergency teams have arrived to respond to the damage and devastating flooding caused by Cyclone Idai in Malawi, Mozambique, and Zimbabwe. The need for a massive emergency humanitarian response is now beyond any doubt. On Thursday 21 March, after two-and-a-half days on the ground in very challenging circumstances, our emergency team managed to move from assessing needs to providing medical assistance. We now have emergency response teams on the ground in all three countries. In recent days, assessments have been carried out and we are now starting medical activities and responding to humanitarian needs. Teams are mobilising to provide medical and non-medical assistance. In our warehouse in Brussels, an enormous supply and logistics operation is underway, with tons of supplies being sent to the affected areas, particularly Mozambique. Following Cyclone Idai hitting the coastal town of Beira on March 14 and devastating the coastline of Sofala, Zambézia, and Inhambane provinces, 90 percent of the area around Beira has been destroyed, main roads leading into Beira have been cut off, buildings have been submerged and severely damaged, and all business has been shut down. There is no power in Beira and surrounding areas, and nearly all communication lines have been destroyed. This has made assessment of the human toll and scale of disaster extremely difficult. At least 84 deaths and at least 1,500 injuries have been reported between Beira, Dondo, and Chimoio cities. MSF’s medical activities in Beira hospital, in local health centres, and throughout the community have ceased completely. All MSF staff have been accounted for, although several staff were injured. Following an early assessment, an MSF emergency team will conduct a wider assessment on the extent of the damage and needs in Beira. MSF’s main concern is to ensure continuity of care and referrals at the health centres. Medical teams anticipate that water and hygiene needs will remain high in the coming days. Cyclone Idai hit Chimanimani, a small district of approximately 30,000 people in Manicaland province, late on March 15 after passing through Mozambique. As of March 22, 154 deaths, 162 injuries, and the displacement of nearly 5,000 people have been reported. Several roads leading into Chimanimani have been cut off, hampering the emergency response. However, an MSF team has gained access to Chimanimani and is now working with Ministry of Health staff at the district hospital. Two outreach teams are also active in the district, attempting to reach as many of Chimanimani's 20 health clinics and settlements as possible to assess health needs and distribute essential medicines, basic supplies, and aqua tablets to purify water for drinking. We also continue to provide consultations and medical supplies in a stabilization centre set up on the outskirts of the district. Additionally, an MSF team from Chipinge has reached Copper, a valley to the south, to conduct an assessment of the needs. So far, health needs in Chimanimani include trauma care, refills of antiretroviral drugs for HIV patients, and medications for chronic diseases. However, the longer-term consequences of the destruction caused by the cyclone must be addressed as well. Disruption of electricity has affected routine vaccination services; stocks of medical supplies and drugs are dwindling; long-term treatments for HIV, tuberculosis, and chronic diseases have been interrupted; and there is a general lack of sanitation supplies like detergent and chlorine. Extremely heavy rains in lower Shire River districts of Chikwawa and Nsanje, compounded by further rains from last week’s Cyclone Idai, have caused severe flooding. Rivers have broken their banks, affecting some 16,000 households in Nsanje, according to the national disaster report. Huge numbers of houses collapsed, and thousands of people remain in displacement camps and makeshift shelter sites at schools and churches. Official figures confirm 56 deaths, 577 injured, and three missing. Due to concerns about the potential for the spread of cholera, MSF is building a four-bed cholera treatment unit in order to be prepared in the event of an outbreak.